The chain of T-LAB Professional salon & stores and VLADIMIR TARASYUK hairdressing art-studios and T-LAB Professional mono-brand stores is one of the most powerful salon & store chains that provide exclusive services and offer high-end products for more then ten thousand customers. VT HOLDING intrinsically leads fashion, identifying new trends and aligning with people who are passionate about fashion and culture. The Salons are the ideal place to appreciate great hair care and beauty services and products collections in a chic setting. 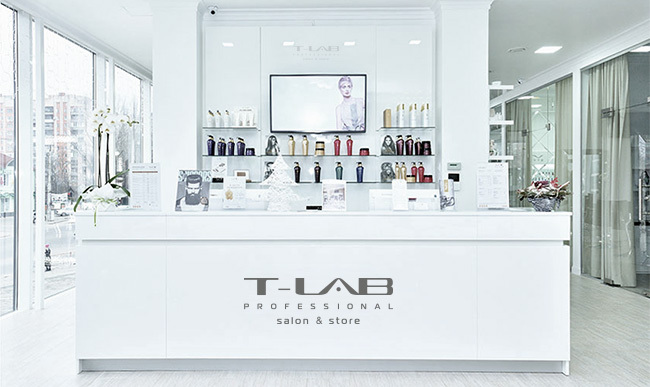 Located in the prestigious regions — the most exclusive luxury beauty locations, T-LAB Professional salon & store chain provides a thorough selection of beauty services: Exclusive Colour Services, Women & Men Haircut and Style, Hair Design, Make-up and Nail Art. Both the services menu and interior design showcase a classical yet contemporary feel, integrating international elements with a traditional beauty offering. There is an energy to the place but the service and style makes it the ideal place to relax in. The T-LAB Professional salon & store and Vladimir Tarasyuk multi-brand stores interior is both elegant and luxurious, in line with VT HOLDING signature style. Creating a refined, understated ambience with a decor that reflects the design concept of T-LAB Professional mono-brand stores around the world. The furnishings, colours and structure of the space are perfectly balanced to welcome customers into an intimate and harmonious atmosphere. Rich textures and finishes of the Stores reinforce the VT HOLDING quality focused heritage. People who become T-LAB Professional salon & store franchisee are passionate about fashion and luxury, and are ardent ambassadors for VT HOLDING and everything the brand stands for. They are cosmopolitan and cultured, and appreciate beauty in a chic setting. Introduction to the successful Salon business model with high standards: financial system, software, product merchandising and salon service quality system. Training and qualification upgrades for salon specialists by T-LAB Professional Academy : hairdressers, administrators, directors. Being T-LAB Professional salon & store franchisee will allow you to develop your own business quickly and become a successful entrepreneur.